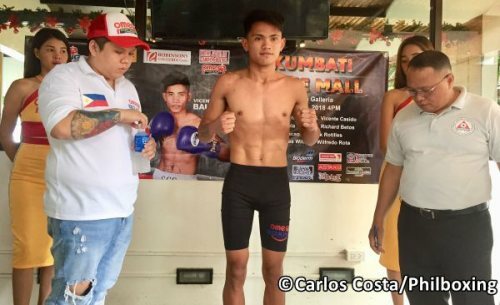 CEBU CITY - Tough Omega warrior Ponciano "Ponce" Remandiman (8-4-1, 4 KO's) of Leyte came-in at 116.9 pounds while Vicente "Enting" Casido (6-1-1, 2 KO's) of Dumaguete tipped the scales at 116.7 ahead of their eight-rounder #Kumbati tomorrow Saturday (Dec 22) at Robinsons Galleria Cebu (top photo). 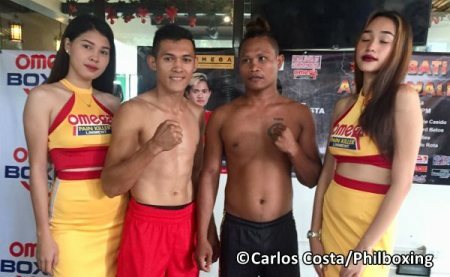 In addition, the "Mr. Hammer" Harmonito Dela Torre (19-2, 12 KO's) of Cagayan de Oro, made 134.9 lbs., as experienced 43-fight-veteran Richard "Tibay" Betos (20-21-2, 7 KO's) of Butuan came-in overweight at 146.5 pounds, for which is is required by the GAB to wear 14 oz gloves. Harmonito de la Torre (2nd from left) and Richard Betos (2nd from right). The 24 year-old Dela Torre - a fighter of the Sanman Boxing Stable in Gensan - aims at scoring an exciting win over Betos to keep his boxing career going forward. Furthermore, 17 year-old debutant "Wild Fury" Bryan James Wild of the Wild Boxing Gym scaled-in at 125.2 pounds against 126.4 lbs made by his more-experienced opponent Wilbert Rota. Their four-rounder clash is in the tough featherweight division. Bryan James Wild on the scales. 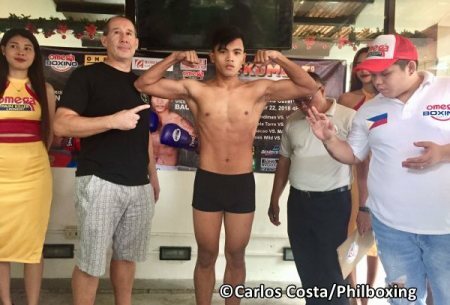 Also in the 126-pound weight class, unbeaten 19 year-old Carlo Bacaro (2-0, 2 KO's) of the Omega Gym in Cebu made 133.6 pounds while on the other corner late-sub Mel Anthony Ando (1-2, 0 KO's) of Mandaue stepped-in at 127.1 lbs. Their tiff is a scheduled four rounds action. The winner of the Bacaro-Ando fight will go after the winner of the Wild-Rota rumble. Bacaro and Ambo pose during Friday's weighin. 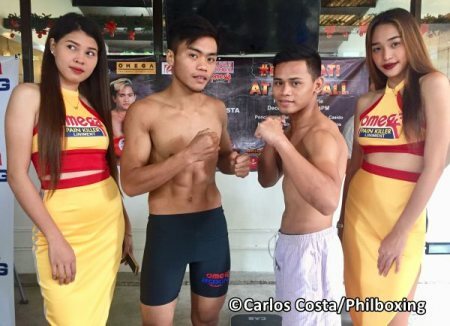 Unbeaten world-ranked knockout Artist Christian Araneta (16-0, 14 KO's) of the Omega Gym is supposed to battle "The Lizard" Vincent Bautista, 25, of Tarlac. Christian Araneta on the scales. Araneta successfully scaled-in at 110 pounds around 12 noon today Friday. But as of 4:30 PM "The Lizard" hasn't shown-up yet, being waited for weight check at the GAB Cebu office by GAB officials Lando Mendoza and Glen Sonido Agena. Will the Lizard show up? The 23 year-old Christian Araneta, a promising and thrilling fighter, needs his stay-busy fight to keep his conditions in tip-top form, as well as his world rankings in check. Currently, Araneta is ranked as WBA # 9, WBC # 10, and WBO # 11. The card tomorrow Saturday (Dec 22) at Robinsons Galleria is sanctioned by the Games and Amusement Board (GAB) Cebu Regional Extension Office headed by Arlene M. Olondriz with the assistance of Rolando "Lando" Mendoza and Glenn Sonido Agena. #Kumbati at the Mall is a production of Omega Pro Sports International and Omega Boxing Gym in association with Robinsons Galleria Cebu and the support of Efficascent Oil, Casino Alcohol, Bioderm Soap, Omega Pain Killer, Restaurant Manggahan in Lahug, and Magic Cebu 92.3 FM. The author Carlos Costa is a fight reporter living in Cebu City. He will attend this boxing show at Robinsons Galleria Cebu. Carlos can be reached by email: Carlos512@hotmail.com and Whatsapp: +639184538152.